Historic investments in green open space along the Yarra created a legacy of liveability in Melbourne. Australia’s major cities are growing more rapidly than ever before, gaining three million residents in a decade. Concerns about the risks to their long-term liveability and health are growing too. Is the consistent placing of Australian cities at the top of most liveable city rankings a reason for complacency? The fastest-growing city, Melbourne, is experiencing unprecedented growth and yet has topped The Economist Intelligence Unit global liveability ranking for seven years running. However, much like Australia’s remarkable record of 26 years of continuous economic growth, many of the policy and institutional reforms that delivered this liveability legacy occurred decades ago. Australia is now undergoing its third great wave of population growth, putting pressure on infrastructure, services and the environment. During the past two waves of growth, in the late-19th and mid-20th centuries, cities implemented visionary responses. It’s largely because of these past phases of planning and investment that our cities have until now been able to sustain their liveability and a reasonably healthy natural environment. A third wave of planning and investment in open space and green infrastructure is now needed to underpin liveability as our cities grow. The past offers important lessons about what made Melbourne, in particular, so liveable. Can we repeat the leadership of yesterday? In the early 19th century, European settlers ignored and displaced the Indigenous knowledge and connections with country. What grew in their place were initially little more than shambolic frontier towns. In the Port Phillip colony, the gold rush, the subsequent population and property booms and the lack of city services led to Melbourne gaining an international reputation as “Smellbourne”. But then, over several decades, visionary plans set aside a great, green arc of parklands and tree-lined boulevards around the city grid. Melbourne constructed one of the world’s earliest sewerage systems. The forested headwaters of the Yarra River were reserved for water supply. Melbourne is today one of a handful of major cities in the world drawing its natural water supplies from closed catchments. And so, together with profound social and cultural changes, the shambolic frontier town transformed into “Marvellous Melbourne”. Sydney and Australia’s other capital cities followed similar trajectories. Then came the world wars and intervening Great Depression. These were times of austerity and sacrifice. Remarkably little investment in open space and green infrastructure occurred over these decades. The 1956 Melbourne Olympics was perhaps the event that signalled the awakening from that somewhat bleak period. It was again time for optimism and vision, with the post-war population boom well under way. Australia’s population was booming at the time of the 1956 Melbourne Olympics, with growth averaging 2.7% a year from 1945-1960 (the 2007-17 average is 1.7%). The 1954 Melbourne Metropolitan Planning Scheme reflected this growing optimism and highlighted the potential for a network of open spaces across the rapidly expanding city. But it took time to build momentum for its implementation. By the 1970s sprawling development had virtually doubled the metropolitan area of Melbourne. Services such as the sewerage system had not kept up. The Yarra and other waterways and Port Phillip Bay were becoming grossly polluted. There was community pressure to tackle pollution caused by industry and unsewered suburbs. In 1971, the Victorian Environment Protection Authority, the second EPA in the world, was created to regulate industry. State and federal governments made a huge investment in sewering the suburbs. The city’s planners revived the earlier vision for Melbourne’s open space network, along with the idea of green wedges and development corridors. Greater prosperity and community expectation secured the investment needed to deliver it. Historic decisions to protect the Yarra River have had lasting benefits for Melbourne. The 1971 metropolitan plan identified open-space corridors for waterways including the Yarra. Land began to be acquired to build this green network and the trail systems that connect it. Victoria became known as the “Garden State” in the 1970s. This period stands out as the city’s second great wave of visionary planning and investment. It created the wonderful legacy of a world-class network of open space, much of it around waterways and Port Phillip Bay. Sustaining or improving urban liveability is a massive challenge. It calls for a new vision and a commitment by governments to deliver it over many decades. Do we have policies and institutions capable of doing this? Rather than “shaping” our cities, many state institutions are dominated by cost and efficiency goals that drive a “city servicing” mindset. Melbourne, for instance, is in danger of exhausting the legacy of the last “city shaping” phase of visionary planning and investment. This all but ended in the 1980s. By 1992, the Melbourne and Metropolitan Board of Works had been abolished. It once had responsibility for town planning, parks, waterways and floodplain management as well as water and sewerage services. It used the Metropolitan Improvement Fund (raised from city-wide property levies) to plan and deliver the city’s green infrastructure, including land acquisitions. Where is the equivalent capability today? Our practitioners have the knowledge, skills and understanding to better plan for complex city needs, but this is not enough to shape a better future for coming generations. Without a vision and effective policies and institutions to deliver it, we risk ad hoc and wasteful decision-making and investment. The result will be poorer community well-being and less economic prosperity. The entrenched cost-efficiency or “city servicing” mindset is an all-too-narrow and short-term policy setting in an era of unprecedented urban population growth. Expanding suburban fringes will lack amenity and a healthy environment, which may entrench disadvantage. Existing suburbs also need to improve quality, access and connectivity of public open space. Green streetscapes, open space and tree cover are important for amenity. This includes countering urban heat in a warming climate. Co-ordinated investment in green infrastructure can also unlock new economic opportunities for our cities. But, as the past has shown, little will happen without an effective city-shaping capability. Significant policy and institutional reforms, guided by a new vision, are essential to ensure a healthy environment, community well-being and the liveability and prosperity of our cities for decades to come. Growth in fossil fuel emissions slowed in 2015, so have we finally reached the peak? Despite robust global economic growth over the past two years, worldwide carbon emissions from fossil fuels grew very little in 2014, and might even fall this year. A report released today by the Global Carbon Project has found that fossil fuel emissions of carbon dioxide grew by only 0.6% in 2014, breaking with the fast emissions growth of 2-3% per year since early 2000s. Even more unexpectedly, emissions are projected to decline slightly in 2015 with continuation of global economic growth above 3% in Gross Domestic Product. This is the first two-year period in a multi-decade record where the global economy shows clear signs of decoupling from fossil fuel emissions. In the past, every single break or decline in the growth of carbon emissions was directly correlated with a downturn in the global or regional economy. However, it is quite unlikely that 2015 is the much-sought-after global peak in emissions which will lead us down the decarbonisation path required to stabilise the climate. In a separate paper published today in Nature Climate Change, we look in more detail at the possibility of reaching global peak emissions. The principal cause of this unexpected lack of growth in emissions is the slowdown in the production and consumption of coal-based energy in China in 2014, followed by a decline in 2015. This has taken China’s emissions growth from close to double digits during the past decade to an extraordinary low of 1.2% growth in 2014 and an unexpected decline by about 4% projected for 2015. Although China is only responsible for 27% of global emissions, it has dominated the growth in global emissions since early 2000s. Therefore, a slowdown in China’s emissions has an immediate global impact. Further adding to this main cause, emissions from industrialised economies, including Australia, Europe and the United States, have declined by 1.3% per year on average over the past decade, partially supported by extraordinary growth of renewable energy sources. In the past every time emissions have fallen has been associated with economic recession. 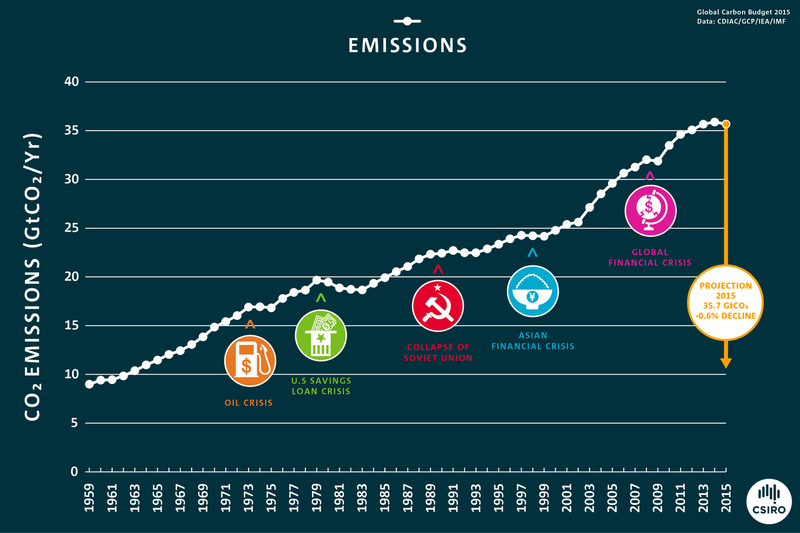 Have we reached global peak emissions? Most likely not. One key uncertainty in answering this question is the future of coal in China. But China is pushing to achieve peak carbon consumption as early as possible (and emissions by 2030), and to phase out the dirtiest types of coal from the nation’s energy mix, largely in response to a pollution crisis affecting many of its large urban areas. It is well within the possibilities that growth in coal emissions in China will not resume any time soon, and certainly not at the fast pace of the previous decade. A strong basis for this assessment is the remarkable growth in non-fossil fuel energy sources such as hydro, nuclear and renewables. These accounted for more than half of the growth in new energy in 2014, with a very similar mix during the first three-quarters of this year. 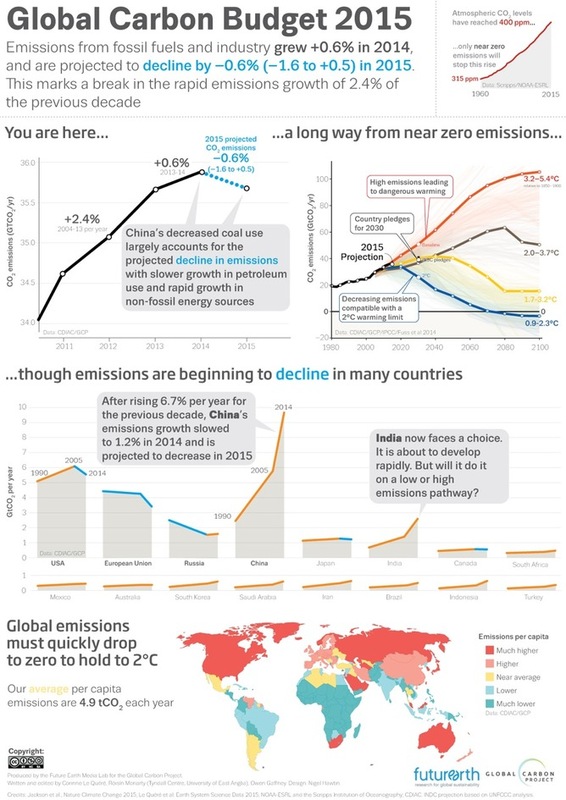 Such structural changes, if continued, could bring China’s peak emissions much earlier than anyone is anticipating and certainly well before 2030. Although it is unlikely that we have reached global peak emissions, it is very likely that 2015 marks a new era of slower growth in fossil fuel emissions. This is perhaps the first sign of a looming peak on a not-too-distant horizon. Recent modelling analyses of post-2020 pledges by over 180 countries to reduce emissions to 2030 (the so-called Intended Nationally Determined Contributions) show that peak emissions is not to come any time soon. Under the pledges made, global emissions continue to rise to 2030. This might well be the future. But models used for such analysis were not that different from those that completely missed the very rapid rise of the Chinese economy in the decade of 2000 and perhaps now its rapid decarbonisation. However, China is not alone in this game. Industrialised countries plus China, accounting for half of global fossil fuel emissions, have pledged to reduce or stabilise emissions absolutely by 2030. But the other half belongs to less-developed nations whose pledges do not include absolute emission reductions but departures from business-as-usual scenarios (meaning emissions can increase, but not as fast). This emphasises the disproportionate importance of international climate finances required to help that “other” half of the emissions to peak and join the decline of the rest. 2015 has been an extraordinary year, and not just because of China. Emissions from Australia, Europe, Japan and Russia have all come down as part of longer or more recent trends. Installed wind capacity reached 51 gigawatts in 2014, an amount greater than the total global wind capacity just a decade ago. Solar capacity is 50 times bigger than it was ten years ago. And emissions from land-use change, albeit with large uncertainties and high emissions from Indonesian fires this year, have been on a declining trend for over a decade. These trends are not stopping here. Yet the current emissions path is not consistent with stabilising the climate at a level below 2℃ global warming. If we maintain the level of 2015 emissions, the remaining carbon budget before setting the earth on a path that exceeds 2℃ is less than 30 years away, unless we bet on unproven negative emissions technologies to remove carbon from the atmosphere later in the century. But 2015 is a historic year to galvanise further action. The trends in emissions are favourable, and countries have the opportunity to negotiate significantly higher levels of ambition to decouple economic growth from emissions. The link below is to a great article reporting on the growth in the population of Mountain Gorillas in Uganda’s Bwindi Impenetrable National Park. The link below is to an article that reports the growth in ice in Antarctica is due to climate change and global warming.